Use Irish Cream oil to give this delicious Jewish pastry a taste of the Emerald Isle. “You can’t beat a babka!” These immortal words, spoken by Elaine Benes and Jerry Seinfeld, introduced the United States to one of the most delicious but one of the most mysterious desserts in the world. As the daughter of two European parents, I was used to hearing oddly named and sounding food on a regular basis. Truthfully, in my mind, I thought they were nicknames my parents had given these foods to make them sound more interesting and appealing. It was only when I grew up that I learned babka is the actual term for this sweet yeast cake which is customary to both Christian and Jewish backgrounds. While both babkas are made with a sweet dough, they are shaped differently. Round compared to double twisted, filled and unfilled, baked in different style pans, and then topped in different ways, crumbs vs. glazes, a splash of rum here and there and so on. We celebrated the Jewish holiday of Purim, and now it’s time for the Irish celebration of Saint Patrick’s Day, a day of celebration that honors the life of Christian Saint Patrick, the arrival of Christianity into Ireland and the heritage and culture of the Irish people and their country. 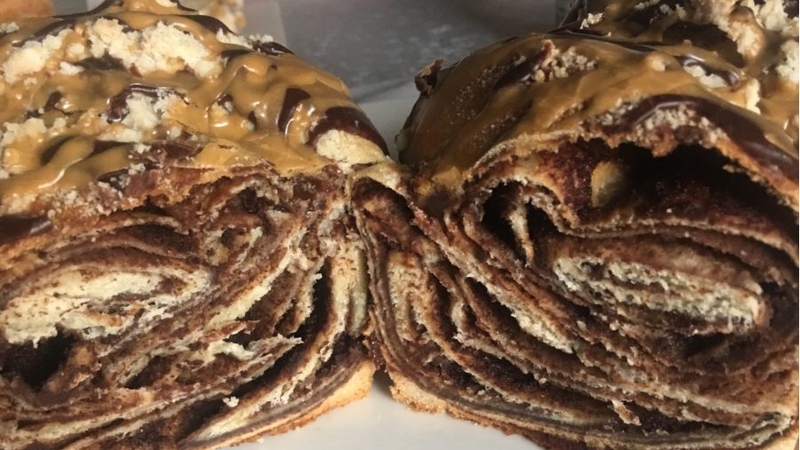 Both are joyous holidays in which we feast, dress up (in costumes or in green) and of course, drink, which is how the idea of a “tipsy babka” was created. You can make the filling with Baileys Irish cream liqueur if you want to make this Babka with dairy, however you’ll find that the flavor bakes off. If you use Irish Cream oil, you’ll find that the flavor is stronger. The oil is very potent and retains its flavor throughout baking and cooling. Use very sparingly as it is very strong. When it comes to the glaze, you can use Baileys Irish cream coffee creamer instead of milk and the Lorann oil. This method keeps your babka alcohol free and festive. Combine water, 1 tsp sugar and crumbled fresh yeast. In order for the yeast to activate, the water temperature should be between 90 and 100 degrees F (if the water is cooler, the yeast will not activate and if the water is hotter the yeast will die). Stir until the yeast is completely dissolved . After about 7-10 minutes the yeast will have become foamy and bubbly. I like using fresh yeast in babka dough because I find it gives the dough a great flaky quality. Note: If using active dry yeast, the water temperature should be between 105 and 110 degrees F to allow the yeast to activate. You can use a clean kitchen/candy thermometer if you want to be exact. Allow to “proof” (yeast should become puffy) for about 5 minutes. Add the remaining sugar, vanilla bean paste (you can also use 1 Tbsp vanilla sugar) eggs and yolks. The yolks add richness to the dough. Using a stand mixer, mix until eggs break apart. Add salt and flour 1 cup at a time, making sure it combines well with the liquid. After about 4 cups add softened margarine and continue to mix. Continue adding flour until the dough begins to pull away from the sides of the bowl. You may need less than 8 cups or more than 9. The dough should be soft and slightly sticky. Grease a bowl and your hands (you may even want to wear gloves) and transfer dough into the bowl, cover with a clean dish cloth and allow to rise until double in size (1-3 hours). In the meantime make the filling by adding ingredients listed above into a microwave safe bowl and cooking at 50% for approximately 2 mins. Stir and repeat until chocolate is melted. At this point add the Baileys Irish cream OR 1/8-1/4 tsp Lorann Irish cream oil. This stuff is very strong so start with 1/8 of a tsp and then taste. The flavor in the oil does NOT bake off, unlike the Irish cream. Punch down dough and divide into five portions. You may freeze whatever you don’t use by wrapping up sections in plastic wrap and placing them in a ziplock freezer bag for future use). Next, make the crumb topping. Blend all crumb ingredients together till crumbly using your hands. Roll out a section of dough into a long thin rectangle. Spread filling and roll up tightly lengthwise. At this point you can cut the roll in half and twist the two together or fold the dough in half like a horseshoe and twist. Place in a greased loaf pan and let rise 30 minutes. Brush with egg and top with crumbs. Place on a baking sheet and bake 35-45 minutes (or more depending on your oven until a deep golden brown and slightly firm). Cool and get ready to glaze. Combine ingredients for glaze. (If you are using the flavored oil add it after glaze is melted). You want a nice thick glaze, similar in consistency to brownie batter. Microwave for about 20 seconds, and then add oil. Drizzle glaze generously over the top using a spoon or from a squeeze bottle. Allow to set, and enjoy. A one-of-a-kind dessert featuring all seven species.